Put your children (age 10-14) into colorful wooden canoes and onto the water during the summer. There are typically 3-4 weeks to choose from in July and August. The program runs each week Monday through Friday, 8:30 AM - 1:30PM. As a River Ranger, they will explore the Navesink and Swimming Rivers, enjoy paddling, swimming, and learning something of the on-water and under-water life while having fun! Canoes, life vests, paddles, and qualified, experienced adult supervision are all part of the package. Just add your children! 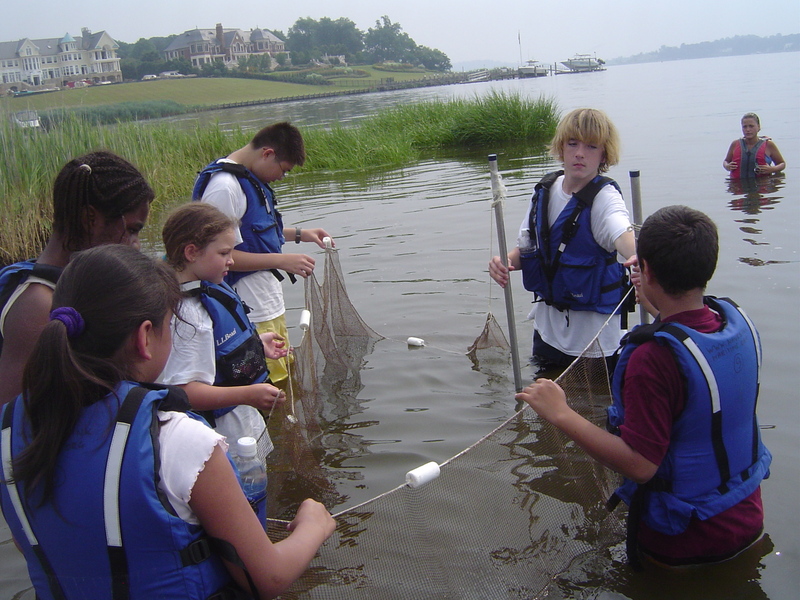 Navesink Maritime Heritage Association has offered the River Rangers program each summer for many years and won awards for the program. Certified teachers have many years experience managing River Rangers on the water. Each year, NMHA offers five to six weeks to choose from, with up to 20 paddlers each week. NMHA holds an Informational Meeting for you and your River Rangers prior to the start of the program. This meeting provides you with detailed instructions for a successful on-water experience. NMHA does not provide transportation to the starting (put-in) locations or from the ending (take-out) locations. Parents/guardians receive a schedule of locations at the Informational Meeting. 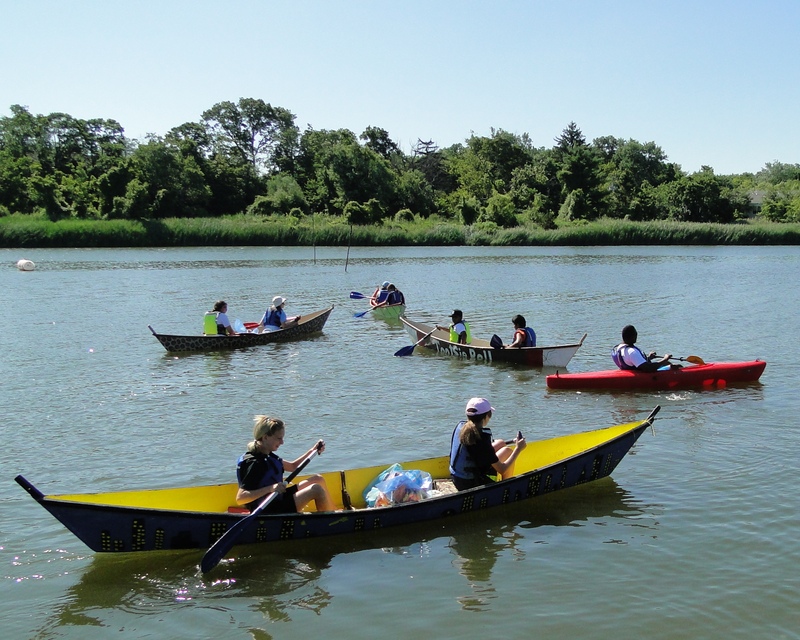 After NMHA built a number of wooden canoes during its Community Boat Building events, it became apparent that most participants could not make use of their canoes due to lack of river access and/or boating experience. In 2002, NMHA organized the first Eco-Trip for Community Boat Building participants. This 1-day canoe trip started on the Swimming River near Route 520 and ended at the Monmouth Boat Club. The paddlers were accompanied by experienced canoers and a local naturalist. Just like the boat building programs, NMHA realized that trips like these were powerful settings for experiential education, but they needed some support and guidance. So NMHA developed a curriculum that resulted in the River Rangers program, which has been in continuous operation since 2004. There is great variety and flexibility in these 5-day programs that use the brightly painted wooden canoes (with designs and painting by children and adults). Up to 20 children and two experienced counselors/instructors explore the Navesink and Swimming Rivers and Shadow Lake over the five days they are on the water. NMHA owns a custom trailer that transports supplies for an entire River Rangers group, to and from the various river locations: canoes, paddles, life jackets, and materials. NMHA is available to consult on the development of customized River Rangers programs for other community and school organizations. 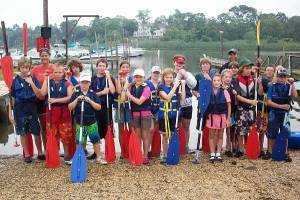 River Rangers is a multiday exploration program of the Navesink River and its inlets using canoes provided by NMHA. The instructors are fully qualified (CPR, Life Saving, etc) adult local teachers. Kids who sign up will have a five day on-the-water experience not to be forgotten.